Chevrolet’s new compact sedan, the 2011 Cruze, is a well-diversified lineup, giving buyers real choices to consider when selecting engines, transmissions and trims. Regardless of the model they choose, buyers are going to get a lot of car for the money. For one, the 2011 Cruze is standard-equipped with 10 airbags — the most in its compact sedan segment — as well as OnStar 9.0 with Automatic Crash Response, which informs the OnStar advisory center of the severity of the accident, whether it’s severe, moderate or minor. 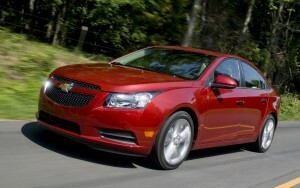 The 2011 Cruze is a front-wheel drive sedan offered in ECO, LS, LT and LTZ trims starting at $18,175. Buyers have the choice of a 1.8-liter naturally aspirated four-cylinder engine or a 1.4-liter turbocharged four-cylinder. Both offer 138 horsepower and are fed regular unleaded gasoline. Where they differ is in the torque ratings: the 1.8-liter produces 125 lb.-ft. while the turbo model delivers 148 lb.-ft. These engines can be coupled to either a six-speed manual or a six-speed automatic transmission. Our tester was the top trim model, the $21,975 Cruze LTZ with the 1.4-liter turbo four-cylinder linked to the automatic transmission. We also had the opportunity to contrast the LTZ to the base model of the Cruze lineup, the ECO, also equipped with the turbo engine, but priced $3,800 below the LTZ. The ECO comes standard with the six-speed manual. And guess what? The base model is pretty impressive. The ECO just might be a far better buy than the uplevel model. The Cruze ECO is a hands-down winner for its fun-to-drive factor. The manual transmission shifts better than the automatic, which in the case of our tester sounded like it had too much hard work to do. Also impressive were the EPA highway fuel economy ratings on the Cruze ECO manual: 42 miles per gallon. In city driving the turbo manual doesn’t produce the dramatic numbers, coming in at 28 mpg. Additionally impressive is your gas dollars will go further in the ECO’s smaller fuel tank of 12.6 gallons. The Cruze LTZ automatic has a 15.6-gallon fuel tank and returns EPA economy ratings of 24 mpg city and 36 mpg highway. Many of today’s sedan buyers prefer automatic transmissions to manuals, and they’re easier to handle in the snow and slippery roads. We drove the ECO manual over snow-covered roads and slid around a little out of first gear — a real nuisance to drive on these occasions. In the passenger interior compartment Chevrolet has made big strides in eliminating the cheap plastics and hollow sounds that allow road and engine noise to enter. The Cruze feels well-insulated from outside noises and creaks as a result of higher quality assembly tolerances. The entire length of the dashboard and the door panels feel and look solidly sturdy, plus show improved aesthetics in design elements with soft-touch controls and low-gloss panels. The ice-blue illumination in the instrumentation gauges is an appealing modern design. 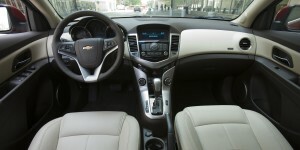 While the 2011 Cruze is a compact, five-passenger sedan, it does convey a sense of being bigger. The wheels show prominently around a sculpted hood and rounded, short rear deck. Standard wheels and tires are 17-inchers on the ECO, with 18-inch alloy wheels as standard on the LTZ. Supporting a fast look of action on the Cruze are an arching roofline and sloping rear pillars that give off a coupe sensibility to the Chevy.